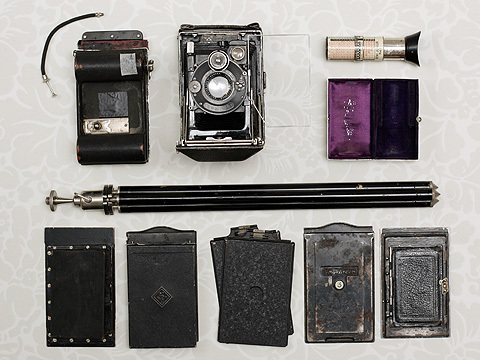 Accessories: rollfilm adapter, extinction meter, tripod, film sheet or plate holders. 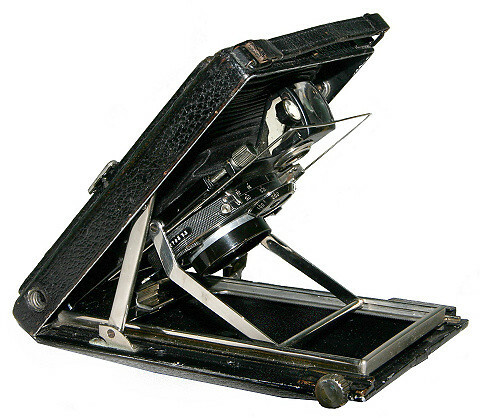 The Patent Etui are extra-slim folding plate cameras, they were manufactured in two sizes 9×12cm and 6.5×9cm by KW Kamera Werkstätten Guthe & Thorsch of Dresden between 1920 and 1938. Although originally designed for glass plates both sizes also accept Rada or Rollex 120 6×9 roll film backs as well as film packs. 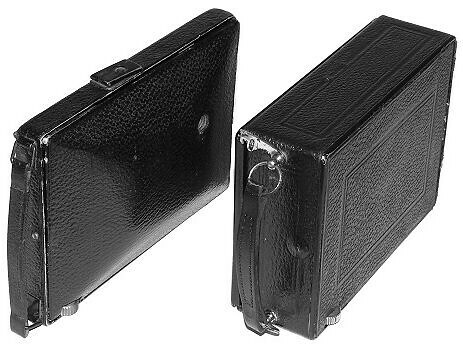 The 9×12 Patent Etui weighs 815g, and was considerably smaller than most of its German competitors. 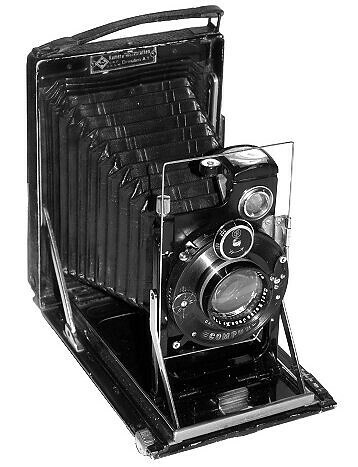 In comparison a 4×5in Crown Graphic weighs 2.4kg. 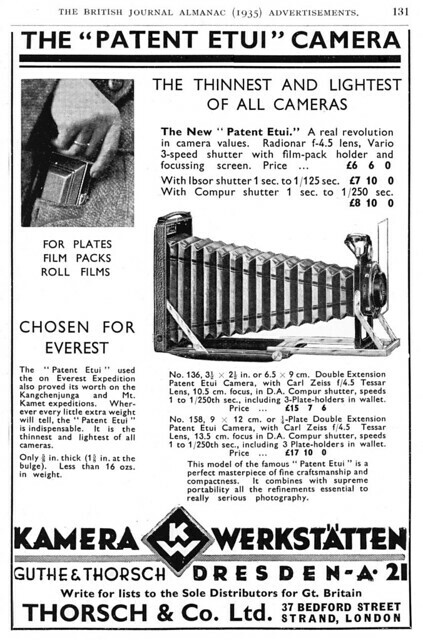 The 9×12 cameras were often fitted with an f/4.5 135mm Zeiss Tessar initially in a dial-set Compur, and after 1931 in the new rim-set Compur. They were also available with an f/4.5 150mm Tessar. Patent Etui Luxus, 6.5×9cm, Tessar 10.5cm f/4.5, dial-set Compur. The 6.5×9 cameras were usually fitted with an f/4.5 105mm Zeiss Tessar, again in a dial-set Compur, and later in the new rim-set Compur. They were also available with an f/4.5 120mm Tessar. Two budget triplet lenses the f/4.5 & f/6.3 105mm Meyer Görlitz Anastigmatic Trioplan were also available, the f/4.5 in a Compur shutter and the f/6.3 in a 3 speed Vario shutter. One (with blue bellows and covering) was offered for sale at Westlicht with a 12 cm f/5.5 Meyer Doppel-Plasmat (a convertible lens, allowing the rear group to be used alone as a 21 cm f/11, taking advantage of the double-extension bellows; the lens has a triple aperture scale, suggesting that other front groups were available). Patent Etui Luxus, 6.5×9cm, rim-set Compur. Patent Etui 9×12. Among the Patent Etui's attractions was its extreme compactness when folded. 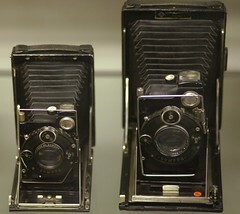 Patent Etui 9×12 (left) alongside an Orionwerks 9×12 camera. ↑ 6.5x9 cm Patent Etui with 12 cm f/5.5 Doppel-Plasmat, and with blue leather, offered for sale at the 28th Camera Auction by Westlicht Photographica Auction, on 21 November 2015. This page was last edited on 4 November 2015, at 23:54.